Answer your child's questions about sunlight and shadows with these light experiments and demonstrations. Some of the activities are appropriate for preschoolers. Others require more thought, but would be enjoyed by elementary children. Did you know that sunlight is very important? You can learn about some of the properties of the sun with these demonstrations. The rotation of the earth causes the sun to be in different positions during the day. You can make a shadow clock. Most of the shadow clocks that I have seen require you to know what latitude you live at. You then need to make a gnomon according to the angle of the latitude. You can make a clock that does not need a gnomon. You will need an empty spool of thread, two pencils, a round piece of paper the size of a dinner plate, glue, and a ruler. You will also need a clock. Glue the spool in the middle of the paper. Place a pencil in the spool. Draw an arrow on the paper. Find a place where the sun shines all day. Place the arrow so that it points south. For each hour from sun up to sun down mark the shadow on the paper. The below light experiments show that sunlight can make the colors of the rainbow. You can see a rainbow if you place a glass of water on a white piece of paper in a sunny window. When the sun shines on the glass you will see a rainbow. You can also see a rainbow by holding a prism in the sun. You can spray water from the hose on a sunny day and see a rainbow. Plants use sunlight to make food by a process called photosynthesis. My Plant Experiment page has an experiment where to show the effects of sunlight on plant growth. There are also several different types of rays in sunlight. Besides visual light, sunlight gives off ultraviolet, x-rays, infrared, and radio waves. I am glad that there are other things that make light besides the sun. You can have your child list the different items that give light. He can then make a simple electric circuit. You will need a Dry cell battery, two plastic coated copper wires, and a light bulb. 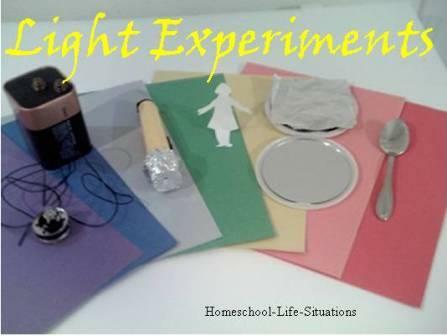 Have your child experiment on how to make a light circuit. Light travel in a straight line. You can demonstrate this with a flashlight and some foil. Place a piece of aluminum foil over a flashlight. Make a small hole in the foil. Have your child turn on the flashlight in a dark room. You will be able to point to objects with the light. Light experiments with shiny objects are fun to do. You can take the foil covered flashlight in a dark room. Point the light at the mirror or other shinny object. The beam should be in different location. The reason that you see your refection in a mirror is because of light bouncing off something and into a mirror. The rays then bounce off the mirror and into your eyes. Shinny objects can also show a reflection. Find as many objects that you can. Do the reflections look the same in all of the objects? Light can pass through some objects and not others. Do a light experiment by collect as many objects that you can. Point a flashlight at the objects. Which objects allowed the light to travel through them? Make a chart. Since light does not pass through thin cardboard or your hand you can make shadow puppets. Cut shapes out of cardboard. Make a handle by taping a piece of paper on one of the sides. Place a sheet over a table so that it hangs down. Place a light behind the sheet. Dance your puppet between the sheet and the light. Your partner should see a shadow of the puppet dancing on the sheet. You can also make shadow puppets with your hand. By holding your fingers and fist a certain way you can see an image of animal such as a rabbit. I have never been very good at this. Why do we see objects with different colors? Part of the reason is that the way our eyes and brains work. Also objects can reflect colors and absorb others. A rose is red because it reflects red light and absorbs the other colors. If all light waves are reflected the item will be white. You can demonstrate how objects reflect colors. 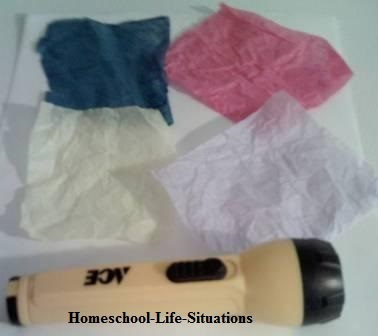 Collect different colors of tissue paper. You will also need a white piece of paper and a flashlight. In a darkened room, hold a piece of colored tissue close to the white paper. Shine the flashlight through the tissue. The white paper should be the color of the tissue. I found that the darker the tissue the better the color showed on the white paper. When light passes through water or another clear substance it can bend. The bending is called refraction. Place a pencil into a half glass of water. Did you see the pencil bend? Have your child collect other clear things to look through such as ice, a pair of glasses, a marble, and a magnifying glass. Have him record what happens. Light is important for heat. Without having your child touch a light source, have him put his hand close. Can he feel the heat? Light experiments can teach your child about the world that he lives in.